December 4, 2018 is National Cookie Day and a number of brands are offering a cookie freebie or deal to help you celebrate. - Coolhaus - Free cookie with any purchase on December 4, 2018. 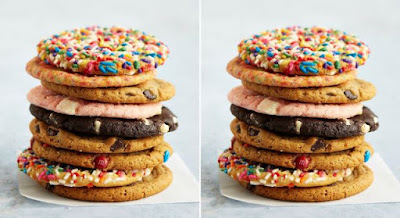 They also a 20% off ice cream sandwiches code ("CHCOOKIE") for online orders on December 4, 2018. - DoubleTree by Hilton hotels - You normally get free cookies for staying at the hotel but on December 4, 2018, anyone can just walk in and get a free cookie. - Great American Cookies - One free original chocolate chip cookie at participating stores on December 4, 2018. - Insomnia Cookies - One free traditional cookie in-store on December 4, 2018. From December 5 to 6, get one free traditional cookie with purchase for any delivery order. Online only - 20% off all shipping orders through 3 AM on December 10, 2018 when you use the code "gift20". - Mrs. Fields - One free cookie with any purchase on December 4, 2018. - Penn Station - Free chocolate chunk cookie bite with any sandwich purchase. - Schlotzsky's - Free cookie with any entree purchase on December 4, 2018.